“Let me tell you why you are here. You’re here to be salt-seasoning that brings out the God-flavours of this earth. I trust that your week has been well. I am still encouraged after the response that you gave last week as we shared our Commitment Sunday together, ‘Living Fruitfully as Disciples’. I trust there have been occasions where God has blessed your journey. This morning we will focus on ‘Salt and Light’, Matthew 5, from part of the Sermon on the Mount given by Jesus. Where do you stand? What is salt and light? How does that fit into our daily living? I believe it follows on seamlessly from last week and this morning it will give you further food for thought and encourage you in your walk with God. This evening we will be having ‘Soldiers Meeting’ at 4pm – an opportunity to hear what we have done over the past year and look at the future. What is our vision, our direction, what will we look like in 10 years’ time? Also, you will be able to ask questions about the running of Chatham Citadel Corps, programme, finances etc. You also may want to give positive comments on opportunities for the future of the Corps. Come ready to participate. Uniforms will be not necessary as no sections will be required. God Bless Chatham Citadel Corps today. FLOWERS – We are grateful to Linda and Graham Tout for the flowers which adorn our hall. (Thanks to Joan for arranging them). Please add your name to the list of dates on the notice-board if you wish to donate flowers. Pray for the New Road School project. For both SA volunteers, staff and children involved. Thank God for the receptiveness of the children to the teaching. Pray for all those needing food from the Foodbank and for our volunteers who are working hard to fulfil this need. Pray also for the L.I.F.E. volunteers and guests that lives will be changed. Please let Jean know of any urgent prayer requests for the supportive prayers of the Prayer Chain. Email her on jeanmjones86@yahoo.co.uk or text on 07787718273. Prayers can also be put in the Prayer Box at the back of the Hall. They will be added to the prayer book and prayed for on Friday. Can I respectfully ask those with Blue Badges to not park immediately outside the front doors of the Hall on the roadside. Please drop off your passengers then park on the cobbles behind the hall displaying your blue badge. Every week the meetings are recorded and sent out to those who are unable to attend – I am grateful to Lisa Davis who carries out this important ministry. I thought to highlight this fact as there may be others who you know and who could benefit from this service. Please speak with Lisa. Are you a qualified First Aider? If you are, would you consider being on a list at the hall to be called upon in the event of an incident? Please speak with Major Ian. As you are all aware the Foodbank is an amazing service that operates from the hall. Last year over 4800 people were helped with food parcels, including over 1900 children. It is a much-valued service and I am grateful to Fran and her team for all their hard work. Mike Rowley has been on the team for a number of years and is looking to take a step back. We are looking for someone to take on this voluntary role. If you are able to give two mornings a week to be a part of a very important team and service, please speak with Major Ian. For further details please speak to Shingie. Our 10am meeting will take the theme of an International flavour with participation from African and Norwegian Salvationists. I have been asked about the giving of the Self Denial Altar Service and the Harvest Altar Service in 2018. 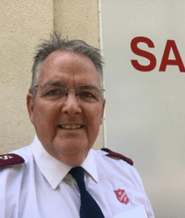 Apologies that these have not been circulated and thank you for your giving to these two important areas of The Salvation Army Work. Again, sincere thanks for your sacrificial giving to these two projects. 10am Where do you Stand? ‘Love the Lord your God with all your heart and with all your soul and with all your mind’. This is the first and greatest commandment. And the second is like it:’ Love your neighbour as yourself’. Some things are just not very complicated. Living for Jesus can be boiled down to two principles: love God with everything I am and have, and love others and treat them as I would like to be treated. Not too hard to understand. I guess it’s living it that is the challenge! Love is a verb. We can’t say it enough. Love must not only be spoken, but must also be shown. The beginning of love is God. He showed his love in the most sacrificial of ways so we could know our incredible value to him. The price of our adoption was the emptying of heaven of its greatest treasure, God the Son, who is our Saviour. “Talk is cheap!” “You can tell me with your words, but I’ll show it with my life.” “Put your life where your mouth is.” We know the slogans, now let’s live love in truth. In a world where barter has replaced sacrificial and steadfast love, let’s go against the grain and do the truth! Power! We like that concept. When it is godly power, might does make right, because godly power is accompanied by love and self-discipline. These three together make a person’s life effective. Live life to its fullest: not as a closet Christian, afraid of standing true and firm, but one who lives by God’s power, shares God’s love, and displays God’s virtues. What can truly fulfil and sustain us? Maybe the best way to answer that question is by asking another: What can we keep when our bodies are placed silently in their graves at death? Only our relationship with God and his people last beyond the grave. If he is what lasts, then how can we displace him for anything that doesn’t? How we long for this to be our true confession. We are not yet gold, but long to be. We are not yet fully following his steps, but are trying. We have tried not to turn aside, but we sometimes falter. Thank God for his grace until our intentions and desires are fulfilled!